Recently, Channel 12’s Brahm Resnik did a fantastic job interviewing the GOP Gubernatorial candidates about the latest conservative pet project of eliminating state income taxes for individuals and corporations. Both of the leading candidates in the field, Ducey and Bennett, support the elimination of the state income tax. Jones and Smith have both both been (rightly) skeptical and non-committal on the issue. What would this scheme mean for Arizona’s finances? Individual and corporate income taxes account for almost 50% percent (~$4.1b) of the state’s general-fund revenue. In other words, nearly half of Arizona’s state tax base would vanish, overwhelmingly into the pockets of the rich. Resnik rightly pointed out that over 40% of the reduction would accrue to the wealthiest 3% of taxpayers making more than 200K per year, while less than 10% would go to those making less the 40K per year, making the tax cut highly regressive. What would replace that revenue? The candidates are much less clear on that point. Ducey and Bennett claim supply-side sunshine of increased economic activity and improved business climate will replace lost revenue, but that is merely puffery. The bitter truth is that the state would become even more dependent on regressive sales taxes and higher property tax rates, and essential state services will have to be cut dramatically. 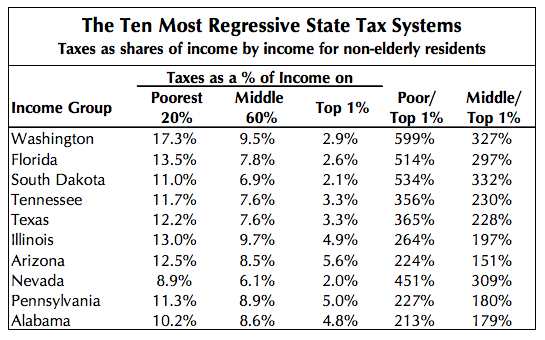 Arizona is already one of the ten states with the most regressive tax burden on our lower income citizens (pdf), pushing down the income tax (the only progressive part of the state revenue mix) will make our tax base even more regressive. Already Arizona’s poorest pay taxes at more than twice the rate of our wealthiest. With income inequality soaring over the past 30 years and becoming a key political issue, Arizona’s leading GOP candidates for governor want to make the situation even worse. This is not solely an Arizona issue, elimination of personal income tax has become a goal for GOP governors around the country, and some states now have pending proposals, and one, Kansas, has implemented major reductions to their income tax with a goal of eliminating it over time. We’ll look at how that is working out after the jump. There is video of Resnick’s questioning of Arizona’s GOP candidates about their scheme after the flip (unfortunately it auto-plays, so be prepared). You can see that Ducey simply refuses to answer the question as to whether his extremely regressive proposal is fair to less-than-wealthy Arizonans. Nor does either produce any plan to address the massive hole they would create in the budget except to broaden or increase the sales tax, exacerbating an already deeply regressive tax base in Arizona. Arizona recently went through a very rough fiscal patch due to the GOP’s 2008 financial melt-down. Our state revenues took a massive hit, mainly due to Arizona’s extreme over-reliance on sales tax, which is highly sensitive to economic downturns and thus a highly volatile source of revenue. As you can see from the graphic, our property and income tax burdens are well below the national average, while our sales tax is one of the highest. The GOP’s sales tax elimination scheme would ensure that, even if we replaced lost income tax revenue with sales taxes, future economic downturns would hit vital state services (especially education and health) with even more vicious cuts than we’ve seen in recent budgets. We’ve seen this mania for lower income taxes play out in at least one state recently: Kansas. So what lessons might be learned from the Kansas experiment? First, income tax cuts do not correlate well with economic growth. Second, massive cuts without any plan for revenue gains create massive deficits. Third, income tax cuts disproportionally harm education budgets and other vital public services already ravaged by recession. Fourth, income tax cuts exacerbate income inequality and push more of the tax burden onto the poor and middle class. These are not positive results, but this is main economic plan of both of the GOP’s front-running Gubernatorial candidates in Arizona: they want to imitate the economic train-wreck Brownback and the GOP legislature created in Kansas. To be fair, Brownback wanted an off-setting broadening of the sales tax base, much as Ducey and Bennett allude to – but his legislature scrapped that part of the reform, keeping only the income tax cuts without offsets. Let’s be realistic: Ducey and Bennett are talking about functionally raising taxes in Arizona, which requires a super-majority vote of the legislature under our dysfunctional state constitution. The likelihood that a super-majority of the Arizona legislature will go along with any tax increase to off-set revenue losses is essentially zero. What we’ll get is cuts without off-sets, and a fiscal train-wreck like Kansas. The same will be true of Ducey’s and Bennett’s proposals. It will be an utter disaster for Arizona if either of these men is elected Governor and attempts to fulfill their campaign promises to implement their income tax schemes. Previous articleAbortion, Drugs, Charter Schools, & Private Prisons: Is It All about Race, Money, & Power? why is pima county the highest taxed county in the state of Arizona? Tucson being listed with Detroit as far as economic growth and phoenix in the top 6 in the country is nuts-when just a few years ago Tucson was on parallel tracks with phoenix! You ask why the most liberal County in the State pays the highest taxes? The answer is in your question: Pima is the most liberal County in the State, that is why the taxes are the highest. I am certain you received great value for your taxes. As to Tucson being listed with Detroit, well, the answer is the same. Enjoy what you’ve purchased. I have been an early childhood educator for 30 years and it saddens and disgust me to see someone like Hupperthal claim to know what is best for children. When was the last time he spent 8 hours in a classroom full of 5 years olds by himself. Has he ever comforted a child who has been mistreated at home? Fed breakfast to a hungry child because there was no one home to deed him? Followed the school bus on the first day of school to ensure your students get home safely? Modified and instructed the curriculum to meet the diverse needs of 25 five year olds? He does not possess the knowledge or compassion to monitor our schools. And after 25 years in PUSD, I am sure Diane Douglas in not fully educated about the common core. Her priorities were never the teacher or children……. Madness. I’d love to see the math on how this is even revenue neutral let alone revenue positive, and the tax burden looks like it shifts to person with the lowest disposable income. It would be a hit on those living on a pension and social security. Really, madness. And if history plays out, one of them will be the next Gov. Nobody is forcing you to read anything here, James. If you can’t tolerate a different viewpoint or provide any constructive commentary, go away. More info on what’s the matter with Kansas and lack of revenue…. You want to live in a civilized society? Taxes are one way we do that. I can think of a few food reasons why ending state income taxes would be a bad idea, but not one of those reasons is my fear that the wealthy would benefit more than the low income would. That old canard is the great bug-aboo of the liberal mind: the wealthy must be punished. Given that petty envy, I have always found it a bit ironic that the Democrat Party has more millionaires in it’s rank than the Republican Party, but I suppose that IF they vocalize the right things, even the sin of wealth can be overlooked. The reason I mention that is throughout the article, that is the recurring theme. Yes, education and healthcare are also mentioned but only as adjunct issues to those dog-gone wealthy people benefiting more from a tax cut. I assume the reason for this is because all logical reasons (such as education and healthcare) really take a back seat to the raw envy of the wealthy. You see, even if money was found for education, healthcare, housing for the poor, school lunch programs, etc., liberals would still demand a progressive income tax. It is one sure way to punish the wealthy…and THAT, my friends, is the real purpose of the progressive tax system. Crackerhead, Reducing income inequality and progressive taxation has nothing to do with punishing the wealthy. You tax the wealthy for the reason bank robbers rob banks: that’s where the money is. The reason why tax policies benefitting the wealthy disproportionately is wrong is because they can afford taxes the easiest, and need the money to support the health of the economy less. People of modest means should pay less because they spend more of their incomes supporting themselves than they wealthy: we don’t want people to have to make the choice between eating or paying the rent and paying taxes. Putting less tax burden on average people encourages spending, which drives our economy, which 70% is consumer spending. Cutting taxes on the wealthy doesn’t have the same effect – it encourages saving. That may be good thing for some purposes, but doing so at the expense of everyone else’s taxes going up, or starving public services and public investments, is short-sighted and harmful to the health of our economy. This isn’t class warfare, it’s sound economic policy. On the surface, that is a reasoned response. I especially like your comparison to why people rob banks. I believe it is very comparable to what happens when you reach your hand into someone else’s wallet and take what you think is a fair share of their earnings to redistribute as you see fit. The only real difference is that one is considered illegal and one is considered an economic necessity by a portion of the population. It IS an economic policy, but it is not a sound economic policy. It has been demonstrated over and over that when taxes are reduced, income to the government goes up. I know that Democrats are smart enough to see that, yet they ignore it and continue to insist on higher taxes on the wealthy. The simplest explanation for this attitude is that income to the government is secondary to punishing the wealthy…and that is class envy. Envy is not a pretty thing, but all the lipstick in the world on the pig of progressive taxation won’t change the underlying reason it exists. It has not been “demonstrated over and over” that cutting taxes results in higher government revenue. I will be the first to concede that some well-designed tax reforms which lower rates can result in higher revenues. Specifically, if one broadens the collection base while cutting overall rates, that can often improve revenues. But it does not at all follow that all cuts will result in higher revenues. Your class envy theme is tired and misguided. If conservatives truly believed tax cuts led to higher govt revenue then it would only be logical for them to demand higher taxes, so as to hasten their cherished day of drowning govt in the bathtub. That particular claim about tax cuts has never made sense. Why would they want to do anything that grows the government? Crackerhead, if you want a better understanding of this subject, I suggest you purchase a copy of Thomas Piketty’s book, Capital in the 21st Century. When your hammer is “funnel money to the wealthy” every objection to it looks like “class envy”. I also suspect that the funding you “find” for indigent health care, education, food support, etc., will be in the form of privatization schemes and charity. IOW Free Market fairy dust. Your choice of the words “funnel money to the wealthy” (which I never used) is telling. If you considering tax reduction or elimination as “funneling” money to the wealthy rather than simply letting them keep their money in the first place, then you betray more than just a hint of class envy and the need to take money from the wealthy as punishment. As to finding funds for all those noble causes, please go back and read what I said. I was hypothetically speaking. Obviously, there are no replacement funds if we eliminated the income tax. That is why, in my first sentence, I stated I can think of several good reason why it is a bad idea. Crackerhead, since you concede that taxes are necessary, why are you certain that liberals want a progressive tax system purely out of a desire to punish the wealthy? I’m for progressive taxes because any other type are regressive. A flat tax, while less cruel than making people pay more tax the lower their income is (which happens to be our current system in AZ vis a vis state and local taxes), is still unfair. When you add up the benefits rich people derive from the state in terms of protecting their assets and ensuring continued profits (police, infrastructure, corporate subsidies) and compare them to how little direct benefit non-rich people get from government (most of the “welfare” the rest of us get – public ed, health care, food assistance, etc. – is also a form of subsidy to the rich), it only makes sense to charge them more. Liberals aren’t trying to punish rich people via the tax code. We’re trying not to punish the working class with it. Big difference. One of the major reasons I attribute class envy and punishing the wealthy with the liberal fascination for progressive taxation is because I worked for the County for eleven years reviewing documents, contracts, legal briefs, etc., for five County Departments. These Departments were very liberal by virtue of their missions. While I never discussed politics in the office because it is very unprofessional, that never stopped my clients from discussing it in front of me. Since I didn’t say anything, I guess they felt I agreed with them. Every time the subject of taxes came up, they were very clear that the wealthy got that way on the backs of the poor and they should have that money taken away as punishment. Or, it wasn’t fair they had all that money while others were poor and the government had to set things right. It was always voiced in terms of punishing the filthy rich. This wasn’t just a few people, over the years it numbered in the hundreds of my fellow Arizonans. They were also the Democrat rank and file. Given that, I am always skeptical whenever I am told progressive taxes are a form of altruism. Even when it is explained to me by such reasonable and erudite people as I have encountered on this forum. Actually it requires a 2/3 majority to raise revenue, not taxes. Increasing taxes on certain people, as the lege has been doing for decades leading to our highly regressive taxation, is fine so long as it’s presented as “revenue neutral”. Not that I disagree with you on the prospect of the GOP majority in AZ agreeing to raise any sales taxes, but it’s important to understand what Prop 108 (the 1992 ballot measure that implemented the 2/3 requirement) really applies to (revenue) as opposed to the way it was sold to voters (taxes). True. You are correct, but unless such a reform all pass as a single bill that is either revenue neutral or negative, any later rate increases would require 2/3.